Our small convoy was heading south. Not figuratively speaking, but literally. Wedged between overloaded semi-trailers and engulfed in black exhaust fumes of archaic tank trucks apparently descended from darker industrial ages, we struggled uphill on the narrow mountainous pass road that climbed the western fringes of the Anti Atlas. Passing the outskirts of Tiznit, through deserted hamlets, past abandoned car wrecks and along barren gravel plains flickering in the haze, we continued downhill towards Guelmin, the ancient caravansary once hosting the largest camel market on the African continent. The lush green of palm trees arranged in spacious avenues, red washed mosques and garrison buildings in colonial style were testimony to the former splendour of the Bab al Sahra, the Gate to the Sahara, as the city has been called since the 11th century. We had arrived at the sleepy Al Massira airport in Agadir this very morning. The city of Tan Tan at the banks of the wadi Oued Ben Jelil, named El Hamra, The Red One, was the day’s destination. After that, along the coast of the Atlantic Ocean and via the National Route 1 to Al Ayoune, our course was bound to take us straight to the city of Dakhla. Just now, on a long narrow bridge, we crossed the estuary of the Wadi Draa. From here to Ad-Dakhla it would be another 630 miles down the road. If all went well, we would reach the coastal town at the fringe of the great Western Sahara desert on the second day of our journey. In the lead in a battered Nissan Patrol, our Swiss friend Marc Jost, accompanied by the famous Sergey Vasiliev, scouted for speed traps, which the Moroccan Gendarmerie Royale was quite imaginative in setting up. Marc’s Patrol was equipped with a raised chassis, heavy duty dampers, a dust protected LLDPE snorkel and a high power radio unit, capable of transmitting within a 20 km radius, that came with a six-foot antenna. That the well-travelled vehicle already looked back on a six-digit mileage was compensated by an excellent state of maintenance. Obviously its Moroccan owner, an Agadir-based businessman and acquaintance of Marc, did care for his asset. With my mate and co-pilot Andi Koppelt, I followed in the second car, a Toyota Land Cruiser Prado. Also in a Land Cruiser, at the tail of our convoy were Thomas Füllengraben and Rainer Bartoschewitz, the latter being our mineralogist in charge. 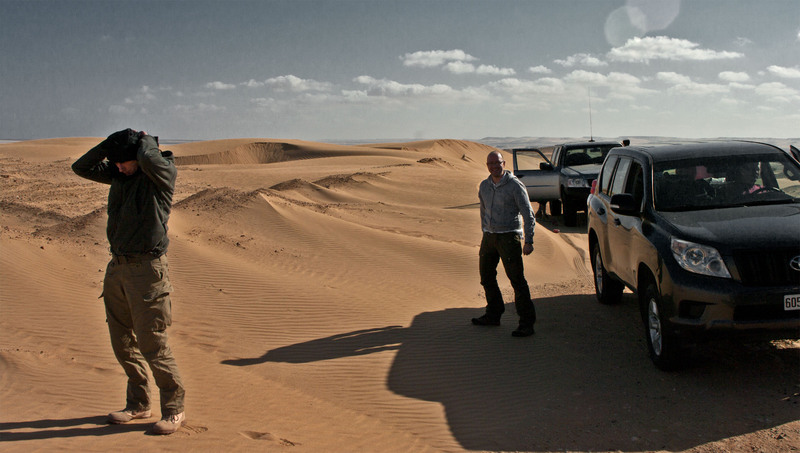 With the exception of Andi Koppelt, all members of the team had earned their share of desert experience on previous trips to other African and Arabian wastelands. Apart from brief jaunts in the back country undertaken on occasion of trips to Gambia and Tunisia, my companion Andi’s knowledge on the interior of continental deserts was limited to hearsay. Irrespective of the above, in the field of meteorite hunting he had already performed with excellence. I had invited Andi to the team for his remarkable achievement on the occasion of a recent meteorite fall in Eastern Europe. There he had walked the remote mountain forests in pursuit of a meteorite strewnfield, the undisclosed location of which was entirely nebulous to those involved in the search. Originally I had planned to accompany him on this trip, but due to eruption of the Eyjafjallajökull volcano in Iceland and its ash cloud that grounded flights all over Central Europe for a week, there had been no way for me to reach the far off location. Despite that he was on his own, Andi, a lawyer by profession, had continued and searched the misty woods for two full weeks, until on the last day, his uncompromising dedication was rewarded by the find of an exceptional 146 g fragment of the rare Meteorite. A few months later, Rainer, Marc, Andi and I had worked together during the search for the remains of the Geislingen bolide that had descended in the shape of a spectacular fireball witnessed by hundreds of observers somewhere on the Swabian Alb in Southern Germany. Although no meteorites were found during that search, I had come to know, trust, and value Andi as an enthusiastic and endurable companion whose skills would be an asset to this expedition. He had accepted my invitation without hesitation. Originally, our good Moroccan friend Aid Mohammed should also have been with us. He was supposed to show up at the airport in Agadir with a truckload of jerry cans, an essential item in our equipment list, as I had pointed out repeatedly. However, when we were released from the airport’s customs section after comprehensive investigations by the friendly chief inspector, Aid was nowhere to be seen. Because I knew that he possessed at least three mobile phones it would be an easy undertaking to get hold of him, or so I assumed. Far from it! Neither by his three mobile phones nor through his extended family, part of which we were familiar with as well, could our friend Aid be reached that day. Still, we had our reception committee. Prior to the arrival of the rest of team, Marc Jost had spent some days in Agadir in order to acquire half a ton of supplies for our three-week stay in the Sahara. He had patiently succeeded in getting almost every item from the four-page list that we had compiled. By now he knew where the relevant bazaars, souqs, hyper markets and hardware stores were, and so he agreed to go on a mission to buy as many jerry cans as he could get, while the rest of us loaded the cars. Three hours later Marc returned. It appeared that jerry cans were particularly hard to come by in the Moroccan metropolis. Even after checking half a dozen places, Marc had only managed to get two of the precious 20-litre steel cans, which left us short ten more. Without additional fuel provision, the operating range of the Prados in rough terrain would be a mere 320 miles and this would limit us to roughly a 160 mile radius from a gas station at the coast. This was unacceptable. We had to improvise. We left our friend Aid a message and started out alone. While on our way south and passing through the hamlets and small settlements, we kept scanning every storefront and market shop near the road for some kind of Ersatz-canister. But when we reached Tan Tan in the evening, we still were without the urgently needed devices. On the morning of our second day on the road, just after we had passed one of the many police checkpoints that were usually located at the village entries, the object of our desire was finally within our grasp. A street vendor, obviously trading in agro-supplies, had a dozen heavy duty plastic canisters piled up next to his shed. We stopped and rolled to a halt in front of his shop. At first he appeared to be upset that our cars masked the view on his displayed goods, however, in expectance of the big business that three cars full of Westerners would surely bring, soon a shy grin appeared on the face of the middle-aged owner. The grin under his chech, which he had tightly wrapped around his head to protect from the morning cold, grew into a broad smile when I mentioned our interest in his complete stock of second hand plastic canisters. Because they are susceptible to UV degradation, plastic canisters are not the ultimate choice when it comes to transport containers in the Sahara. In our case, however, apart from having been used before, the 20 litre units hadn’t suffered too much sunlight exposure and still seemed durable enough to put them into service again. After a little bargaining, the canisters were ours. Happy about the early business, our seller casually slipped the small bundle of Dirhams in his pocket. Contributing to his delight was probably the fact that we had helped him get rid of some shelf warmers. We didn’t mind at all, because now we could tick off a crucial point on our to-do list. What at first had appeared as a classical win-win situation soon had to be re-evaluated in terms of mutual benefit. After Andi and I had stuffed four of the bulky cans in the back of our car and on top of the piled supplies, we continued on the road, but were soon annoyed by the gurgling sounds that were caused by the remaining liquid in the canisters. Unfortunately, the labels were gone, so we could only speculate what they had contained. ‘We better stop and rinse them with water’ Andi suggested. Good idea. And so our convoy pulled over beside a group of low sickle dunes and the six of us started to wash out the remaining liquids. Heavy wind and blowing sand complicated this endeavour. My question to the seller as to the original contents of the canisters had been shrugged off an instant too quickly for my taste. Marc unscrewed one of the caps and conducted an odour test that gave no further clues. Adversity is the school of wisdom I thought, and so I painstakingly avoided contact with the rinsed contents and cleaned my canister at arms length while I carefully paid attention to the wind direction. So did the others. This all went well and half an hour later we were ready to move on. Despite having expended several litres of precious drinking water some diluted fluid still remained in the containers. That got me thinking. Andi had obviously not taken as much caution during the cleaning job. This much, at least, we concluded from the fact that soon after the interlude one leg of Andi’s pants as well as part of one shoe, which apparently had gathered some spray during the rinsing, started to slowly but steadily disintegrate. Namely the black staining around the developing holes allowed us to identify the substance in question as highly concentrated sulphuric acid. We studied the progressing disintegration of my co-driver’s leg wear, which, from a scientific Point of view, I found quite interesting. Understandably, Andi was not amused. 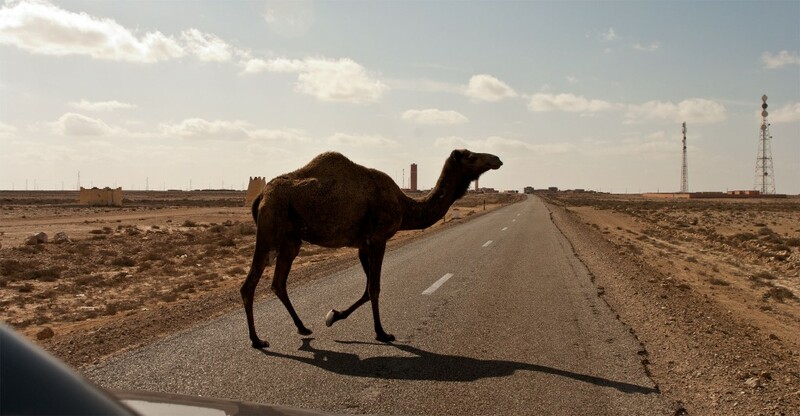 While I trusted my companion had brought a second pair of trousers for the trip, I rather worried for our engines and wondered if a mixture of diesel and sulphuric acid, even if highly diluted, was such a good idea to fill our tanks with while crossing a remote desert. Later that day, on occasion of a fuel stop in Boujdour, we discussed the matter with Mohamed, the serviceman at the gas station. Mohammed looked at us disbelievingly. ‘Aina al muschkila?’, ‘Where’s the problem?’ he demanded. Without further comment he grabbed the fuel nozzle and poured half a litre of diesel into the canister, shook it a little and then poured the contents on the tarmac. ‘Clean’, he proudly declared. With dedication he repeated this process a dozen times with the other containers, one had time to acquaint with the local and rather pragmatic approach in handling hazardous substances. Needless to say, we became good friends with Mohamed. After all tanks had been filled we waved goodbye to Mohamed and left for the road. In the early afternoon, our convoy reached the small track that branched off to the east from the N1 and would lead us into the desert. On our satellite chart, dated 2004, the tarmac road that led to the 50 km distant well of Bir Aridal turned into a dirt track some hundred meters after the turnoff. However, it appeared that the track, which crossed a large gravel plain named Ammat Armaymida, had been tarred in the recent past, so we rolled down a narrow but even road that quickly took us towards our search area and deeper into the desert. After another hour, the road made a bend towards the south leading away from our destination. While part of me had appreciated the easy access, I now was happy to see that finally we had reached pathless territory. As our convoy pulled by, I grabbed the charts, spread out the map of our first search area on the hood and the others gathered around it in a semi-circle. Obviously this rather unceremonious speech provided sufficient motivation because everyone darted into their cars like greased lightning. Marc rolled past me with Sergey thumbing coordinates into their GPS. Thomas and Rainer followed, neither of them looking ahead as both were already fully in search mode, scanning the bright gravel surface through their side windows in utmost concentration. The moment each one of us had anticipated for 18 months had finally come. 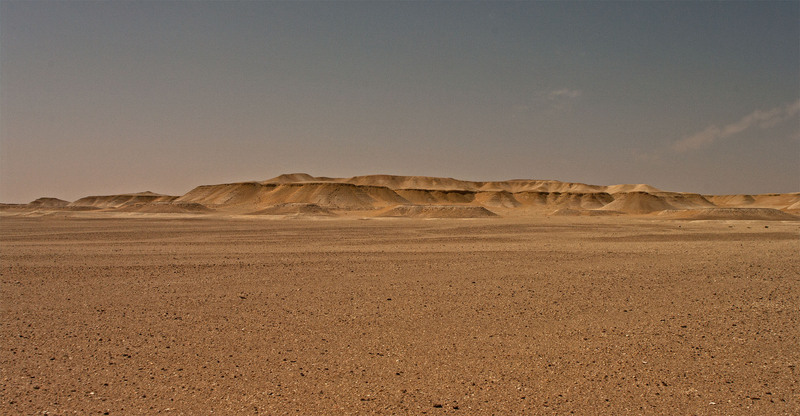 The barren flat serir, which was the local Berber term for the fine-grained gravel plains, stretched towards the horizon under a cloudless, cobalt blue sky. These were promising search grounds, exactly as we had expected when we had chosen the area from our Landsat-images as a potential target. As we knew from previous experience, however, this was by no means a matter of course.